According to William Shakespeare, celebrities are celestial. They sparkle and shine, exhibiting a glow of their own amidst the glitz and glamour of stardom. The nature of fame has transformed dramatically in the age of technology. Gone are the days where celebrities are ‘forgotten’. The advent of social media has made it possible for a once-forgotten star to be relevant again. A tweet, a post or a single vlog could be all that is needed to revitalise their popularity. Even for celebrities who have committed social faux pas, it is still possible that they rebuild their popularity and brand by taking to their social media accounts to apologise or explain themselves. The emergence and development of mobile technology and smartphones in the last two decades has had a significant impact on communication and the media across the globe. The Internet has put connectivity and social media interaction in the palms of both the users and market makers, creating new ways in which brands and celebrities engage with their fans and the public. As the number of social media followers of celebrities grow, so does their fan base and popularity. In fact, social media followership on channels such as Facebook, Instagram, and Twitter have become somewhat of a popularity indicator. Through greater engagement that is more intimate and personal via these various social media channels, celebrities have now begun to capitalise on their huge fan bases and public followings. Some have even taken their social media engagement to the next level by monetising them through the sale of their merchandise, promoting fan meet-ups and organising concert ticket giveaways, thus further fuelling fan loyalty and affection. Yet, the question remains: are these popularity indices, which are based on social media followership, true indicators of a celebrity’s popularity? Are renowned popularity listings such as the Billboard Hot 100 or Forbes Top 100 Brands true measures of popularity? What exactly goes into formulating these rankings that provides legitimacy for the public? Fans have often debated on the way in which a celebrity’s popularity is measured. We have never been able to create a popularity listing that is truly indicative of the laissez-faire free market perception, until now. GCOX is the world’s first platform of its kind where celebrities and brands are able to capitalise on blockchain technology, a highly secure and dependable distributed protocol, to truly revolutionise and redefine popularity and celebrity culture like never before. This platform also allows celebrities, at the different stages of their celebrity life cycle, to develop, monetise and revitalise their popularity through the various mediums that are housed on the ACCLAIM blockchain, the foundation blockchain on which the DEX (as defined herein) is housed. Popularity and stardom often rise and fall as celebrities come and go. Despite this volatility, GCOX aims to immortalise popularity and stardom. The rapid rise of blockchain technology has enabled us to conceive of new ways to transact, do business, and interact. Just like in the early 90s, when the internet revolutionised and democratised communication, blockchain technology is revolutionising the way we transact and democratise value and trust. The unstoppable force of blockchain and its cryptocurrencies is influencing and restructuring the modern financial infrastructure through a unique instrument called the Initial Token Sales (“ITS”). As a result, the venture capital industry has begun to take a good hard look at this new financial instrument, known as ‘token sales’ or ‘token launches’. These ‘token sales’ are a new sales phenomenon fuelled by a convergence of blockchain technology, new wealth, and crypto-participants. It is so revolutionary that we can now re-define popularity on a global scale, reaching billions of fans worldwide. Over the years, celebrities, stars, and industry icons have used social media platforms such as Twitter, Tumblr, Facebook, Weibo, and Instagram to successfully boost their popularity and keep their brand names current. In a forecast by an industry expert, eMarketer, the ad spend on social networks will reach US$35 billion and this figure is expected to grow year on year. The amount of money raised from ITSs in 2017 alone is in excess of US$4 billion2 and has surpassed early venture capitalist funding for start-ups. An ITS has become an additional platform for companies to raise money from users and participants via the release and sale of its own tokens. Upon purchase, users and participants will then own such utility tokens, which may be redeemed for products and services, on these specialised utilisation platforms. Celebrities have the ability to influence and impact millions of people across the globe when they tokenise their popularity. By engaging directly with their fans and followers on social media, celebrities are able to leverage on the influence they have over their fans to make positive changes, enhance their career growth or promote their philanthropic and charitable causes. Celebrities are not just people – they are their own brands. Whether they make music, star in blockbusters, write award-winning novels or score the most goals in the World Cup tournament, they capitalise on their brand image for monetary purposes. Many celebrities are also the faces of other brands in their sponsored tweets and Facebook posts. As rules of engagement constantly change, celebrities can now capitalise on social media endorsements to rapidly grow their popularity and stardom. The birth of blockchain allows them to leverage on their popularity by listing on a decentralised popularity index. Blockchain, a decentralised distributed platform, is the technology that powers this potential. Its future development trends and values are also expected to grow and expand with time. This new form of monetisation in the cryptocurrency world called the ITS has paved new ways for celebrities to monetize their popularity, and in some situations, kickstart their careers. Celebrities, fans, and participants will benefit greatly from this platform. They will be able to use these tokens to redeem for various services that the relevant celebrity may provide, under our specialised Celebreneur, Celeb-connect and Celeb-charity platforms. We are redefining popularity by cryptonising a celebrity’s popularity on a global cryptographic token offering exchange that is powered by blockchain technology. We aspire to be the platform of choice for celebrities who wish to bring their stardom and popularity to the next level. (a) Who are our customers? (b) What are their needs? (c) How does GCOX address those needs? 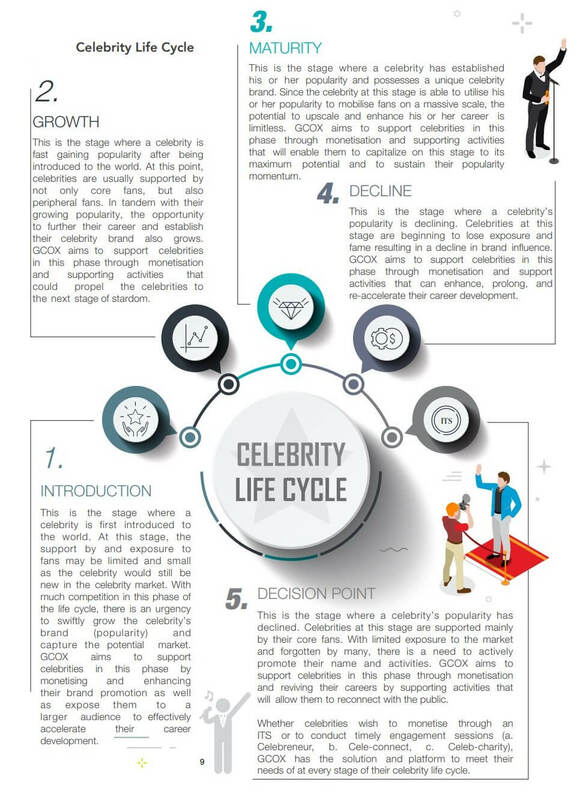 For example, celebrities in the Introduction and Growth stages could leverage on the GCOX platform to promote, enhance, and expand their popularity. GCOX will address celebrities’ needs through its ITS platforms for monetisation, as well as their access campaign platforms to promote their outreach and brand to fans as well as the masses. 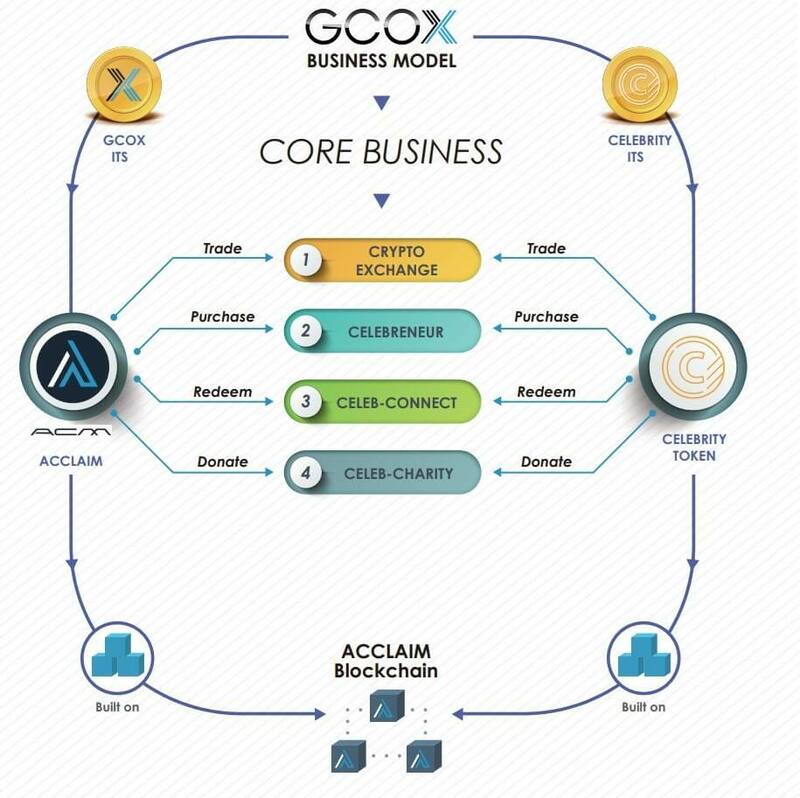 The GCOX model creates a symbiotic relationship in terms of promoting celebrities through the various core businesses and enhancing the interaction and intimacy between them and their fans. These core businesses allow incentivisation, redemption, monetisation and engagement to take place. Details of the various businesses are explained below. Commencement of PR Campaigns . Event Launch with AListers Celebrities, Launch of Acclaim Blockchain, Public Sale of ACM*. Release of ACM Tokens and Launch of GCOX Exchange*. Launch of Celebreneur,CelebConnect and CelebCharity*.